2010 Hesketh Zero DS. Picture credits - Hesketh. Submit more pictures. Designed to be agile in the dirt and quick on the street, the Hesketh Zero DS represents a new kind of freedom. Bypass the ordinary. Blast down a gravel road or a dusty trail. When you�re ready, silently pass from the sublime to the civilized as you arrive at your destination. Seat height: 902 mm (35.5 inches) If adjustable, lowest setting. Comments: Battery: Patent-pending lithium ion array. Capacity	4 kWh (58volts @ 35Ah). Range Up to 2 hours or 50 miles (80km). Recharge time: Less than 4 hours. Standard 110V or 220V input. Ask questions Join the 10 Hesketh Zero DS discussion group or the general Hesketh discussion group. Get a list of related motorbikes before you buy this Hesketh. Inspect technical data. Look at photos. Read the riders' comments at the bike's discussion group. And check out the moped's reliability, repair costs, etc. 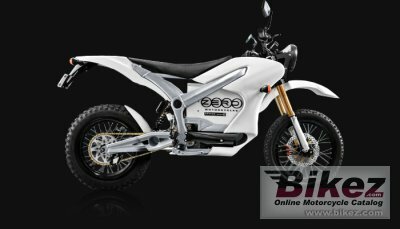 Show any 2010 Hesketh Zero DS for sale on our Bikez.biz Motorcycle Classifieds. You can also sign up for e-mail notification when such mopeds are advertised in the future. And advertise your old MC for sale. Our efficient ads are free. You are also welcome to read and submit motorcycle reviews.